Dr. Todd Lanman is a Board Certified Neurosurgeon by the American Board of Neurological Surgery. He specializes in Spine Surgery and Arthroplasty. He earned his medical degree from Northwestern University Medical School in Chicago, graduating Alpha Omega Alpha and Phi Beta Kappa. He completed his Internship in a General Surgery, and a four-year residency in Neurological Surgery at the University of California Los Angeles (UCLA). 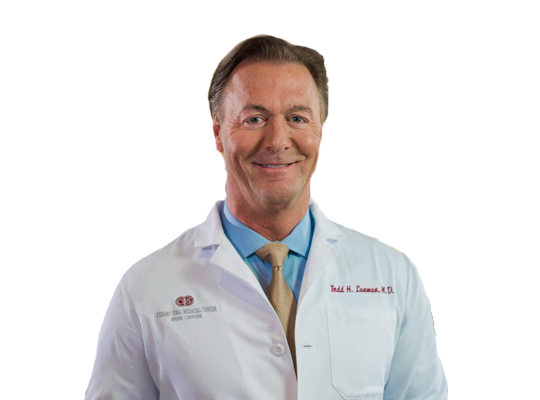 Dr. Todd Lanman has numerous accolades and accomplishments. He has completed abundant research and technical experience in state-of-the-art Neurosurgical Procedures. He has authored and published over ten peer-reviewed articles and book chapters on Neurological Surgery subjects, and presented over 25 papers at national and regional Medical Society Venues. Dr. Lanman is the Assistant Clinical Professor and Fellow at the American College of Surgeons UCLA Medical Center. His current and previous hospital affiliations include: Staff Neurosurgeon at Cedars-Sinai Medical Center, Staff Neurosurgeon at San Pedro Peninsula Hospital, Staff of the Neurosurgery department at Saint John's Health Center, and Staff member at the Neurosurgery Department at Olympia Medical Center. His Profession Memberships include: American Association of Neurological Surgeons, Congress of Neurological Surgeons, North American Spine Society, California Association of Neurological Surgeons, American College of Surgeons and the Spine Arthroplasty Society. To learn more about Dr. Lanman, visit www.spine.md, or call (310) 385-7766 to schedule a consultation. Are you a patient of Dr. Todd Lanman? Login to your Who Is Who account and share your experience with Dr. Todd Lanman. It takes seconds to register. Start your FREE account today and share your expereince with Dr. Todd Lanman.